More often than not, the Grill is the only thing standing between Harvard students and sub-par HUDS days, making it a universal favorite. 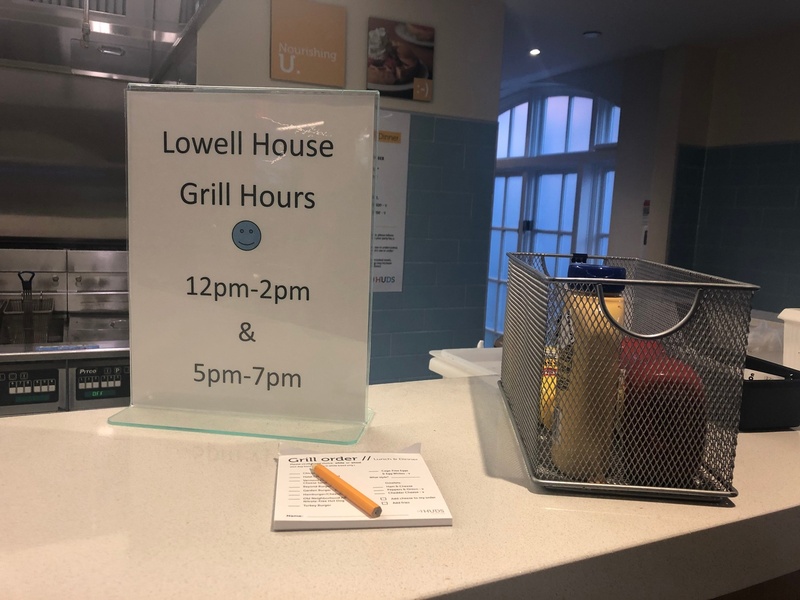 Tragedy struck at the Lowtel, however, when a thief nabbed the d-hall’s iPad, according to Grill staff member James C. Burdulis. After a grueling few weeks of putting pencil to paper to write their meal requests, the convenience of electronic ordering is finally back, thanks to the purchase of two new iPads (unfortunately, the OG iPad still remains missing). To the thief responsible: Instead of robbing the Grill of its beloved convenience, try these items instead. As soon as the weather dips below 50 degrees, it’s open season on everybody’s favorite wintertime flex, the Canada Goose jacket. Whether you’re in need of a warm coat to shield you from the snow as you wait for the Quad Shuttle on a Friday night or just something to match those new Airpods you got for Christmas, this is a great option for those of us looking for a high stakes (but functional) steal. After a full semester without the beauty known as Harvard Time, now is the perfect time to steal it back. Stick it to Bacow and your professors by arriving on your own schedule — seven minutes late of course. Use your newfound extra time to get some extra Tinder swipes in (Valentine’s Day is closer than you think, folks), wait in the mile-long line at the Science Center Clover for a coffee, or hit the snooze button a few more times. While his official role is Dean of the College, Rakesh Khurana’s true job is being the University’s hype man. The man’s Instagram is a legendary collection of selfies with students and other happenings around the University, but appearing on his feed is a blessing only a select few are fortunate enough to attain. Stealing Rakesh’s social media presence would also be a walk in the park — insider intel says that his password is CabotsNumberOneDad. Once you’ve stolen his account, take your rightful place on his Instagram page. A random iPad is hardly a brag-worthy steal. Set your sights higher — snag the most photographed object on campus instead. The resulting tourist rage will put a bounty on your head, making the risk all the more tempting for true daredevils. If you really want to go the extra mile, list the stolen statue on eBay and reap the profits of a bidding war between alumni and Harvard-obsessed high schoolers. For those of us (aka all of us) seeking to live out our Nicholas Cage-inspired dreams, grab a trusty sidekick or two and get over to Washington, D.C. Sure, this one could end with you being questioned by the FBI, but what better way to procrastinate all those essays and p-sets than going into hiding? While all of these suggestions are preferable to sabotaging the Lowell Grill iPad, we don’t endorse adding a felony to your resume. And to the technology thief who’s still at large, we urge you to think of those sad, inconvenienced Lowell students and renounce your criminal ways.